The steel used for the outriggers is 1.5" external diameter 1.6mm wall thickness ERW. Some people have gone to great lengths to source CDS (seamless) tubing but this is about 5 times the price and TVR used ERW tubing anyway. Typically supplied in 6M lengths and retailed at approx �12 for the 6M length from a proper steel stockist. A 6M length will do both outriggers along their full length and across the width outside of the chassis tunnel. I used 100mm x 3mm steel plate and a 1M length was sufficient. I used 75mm x 3mm steel plate and a 1M length was sufficient but more might be required if the inner rear tub mounts need replacing. Check thoroughly the seatbelt mount on the outrigger before replacing the front section of the outriggers. You may find that it is holed and have to replace the whole side length anyway. Make sure you have some ink in your inket printer before you start. There is a program that will print out the mitre cut profile that could be used for the outriggers. I've not tested it due to the lack of ink in my printer but it is available from here and works under Linux using WINE. There is also a lot of useful info in the locost7.info site. 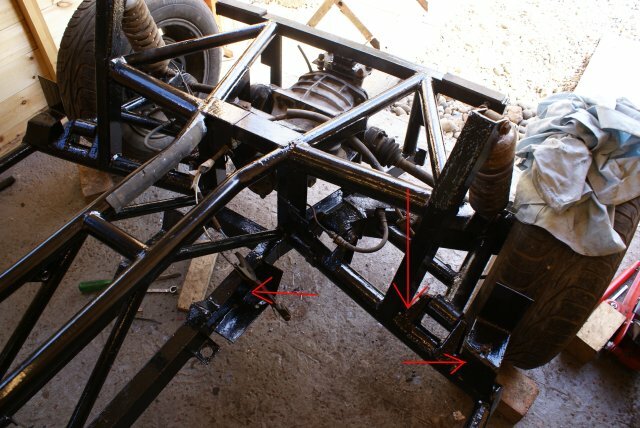 The section between the bracket and the suspension turret is a dirt trap and will cause corrosion of the large diameter round tube that the trailing arm is mounted on. It also corrodes though the mount bracket between the trailing arm mounting bolt hole and the main round section tube. Worth giving it a good prod with a screwdriver and clean it back to bare metal then paint or seal it if all is well. It is quite likely that the seatbelt and tub mount (indicated with the right arrow in the pic above) will have corroded and need replacing. Check underneath as well to ensure that all is well. When the steel corrodes it can produce a very hard iron oxide substance that looks solid but is brittle. Soaking the areas over night with a rust removing solution did cause this hardened layer to lift exposing (hopefully) metal underneath.